If you have a light-colored miniature or toy breed dog (e.g. 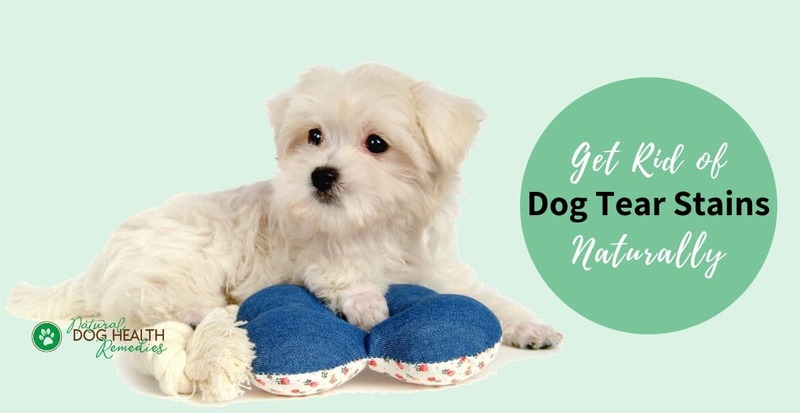 Poodle, Pekinese, Chihuahua and Maltese), you will no doubt notice tear stains on the skin and hair below the inside corners of your dog's eyes. The stains are usually pinkish to brownish in color. Like us, dogs also have tear ducts (in the eyelids) to drain out excess tears. However, if the tear ducts are blocked, the tears overflow the lids and run down the face. The tear stains are caused by a reaction of the tears with the normal bacteria on the hair and skin on the dog's face. Shape of the Eye: Many miniature and toy breed dogs have eyes that stick out. This shape can result in eyelids that become stretched thus cutting off the tear drainage system. An Abnormal Eyelid: Some dogs may have eyelids that turn inward, rubbing against and irritating the eye surface. This problem can be remedied by surgery. Genetics: Some dogs are born with an abnormal drainage system that results in excessive tearing. This problem may or may not be corrected by surgery. Excessive Hair Around the Eyes: Hair can act like a wick, drawing out the tears from the eye. This problem can easily be corrected by removing the excessive hair. Infections: Excessive tears on the face hair around the eyes can cause bacterial and yeast growth, such as the "red yeast" which causes reddish-brown stains. Sometimes you may even notice a strong odor coming from the stains. Tear ducts may also become infected and as a result the affected eye will have excess tearing and staining. Eye Irritations: Excessive tears will be produced if the dog's eyes are irritated, either caused by a particle of a foreign object in the eye, or an allergy. Inflammation of the Eye: Corneal ulcers or inflammation of the duct system can also cause excessive tears to overflow. Untreated, some of these causes of tear stains can be painful. They can also lead to infection and even blindness. If you suspect that your dog's tear stains are caused by an allergy, inflammation, or infection, be sure to ask a vet to check out the dog's eyes. Here are some conventional and natural ways to remove tear stains under dogs' eyes. Conventional treatments include antibiotics (e.g. Tetracycline), eye scrubs and other chemical-based tear stain cleansers. There are also a host of home remedies ranging from bleach, corn flour and water mixture, to Milk of Magnesia, corn starch and peroxide mixture. While these may work to remove the stains, we need to be very careful when using chemicals around our dog's eyes. If we allow any of these mixtures to get into our dogs' eyes by accidnet, we could potentially harm our dogs. As regards using antibiotics to treat tear stains, the problem is that the medicine will weaken the dog's immune system making her more prone to infections in the future. Tear stains are not life-threatening, so the use of strong chemicals, medication, and other "heavy-duty ammunition" should be kept to a minimum. In particular, for dogs that are not being shown, dog parents should aim at taking steps to safely minimize the condition. Before taking any action to get rid of the stains, we should first rule out that the excessive tearing and staining are not caused by any underlying health problems such as mentioned above. To minimum dog tear stains, herbs are beneficial because they are mild and gentle on the dog's skin. The first "eye herb" that comes to mind is Eyebright. This herb is excellent for easing discomfort in the eye and helping to prevent excessive tearing. Eyebright is anti-inflammatory and rich in vitamins A and C. It can be taken internally as an eye tonic. Externally, it can be used as an eyewash. Chamomile: This herb is also anti-inflammatory and is effective against bacteria and fungi. Calendula: This herb is excellent for healing wounds and is also effective against bacteria, viruses, and fungi. Goldenseal: Goldenseal contains berberine compounds that are active against bacteria, viruses, yeasts, fungi, and infections involving the mucous membranes. Tear stains can be caused by bacterial or yeast infection, so it is important to make sure that your dog has a healthy immune system. To prevent eye infections (a cause of excessive tearing), keep your dog's eyes clean. When in a moving car, do not let your dog put her head out of the car window to avoid dust and other foreign objects from getting into her eyes. If you have a long-haired dog, have your pet groomer pay special attention to the hair around the eyes - Trimming the hair short around the eyes can prevent the hair from wicking moisture from the eyes. These wipes contain Lavender, Cucumber, Witch Hazel, and Chamomile, and are pre-moistened with an all-natural, botanical cleansing solution. Witch Hazel cleans away dirt and stains, while lavender and cucumber soften and soothe the skin. Did you know that some eye problems in dogs can lead to excessive eye discharge?